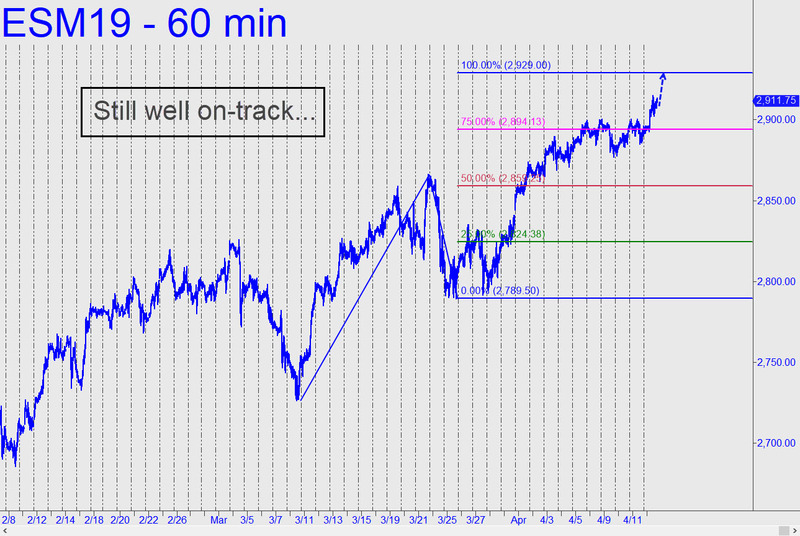 A longstanding rally target at 2929.00 has served us well, keeping us confidently on the right side of the trend. It now looks extremely likely to be reached, but the question is whether it will be decisively exceeded. I expect the Hidden Pivot to show stopping power, probably tradeably so, but I would recommend going short there only if you have made at least 3-4 points of profit on the way up. You’ll need all of it to provide an ample stop-loss on entry. I say this because the C-D rally leg begun on March 25 provided no opportunities to get long ‘mechanically’. This attests to the power of the move, and it raises the odds of a thrust to even higher levels regardless of whether a correction is needed first to get a running start. Even a slight breach of 2929.00 would make a run-up to new record highs all but inevitable. That would not negate my skepticism that the powerful move begun on December 26 has been a bear rally. Too many agree with this judgment, however, to make a move to new highs an easy short.